Your employees aren’t engaged with your company’s message. Yes, I’ll spare you with all the statistical evidence – oh what the heck, I’ll give you a couple of Gallup’s headliners (and here’s a heapful of employee engagement facts if you need convincing): Only 1/3 of the global workforce is engaged at work. 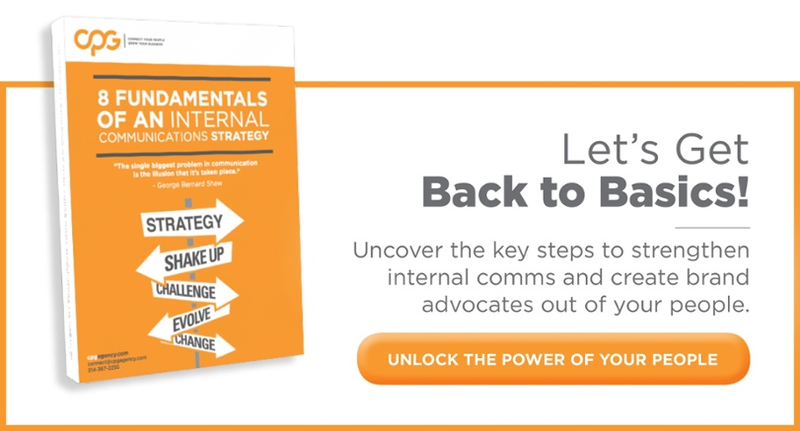 3 out of 4 employees think that their company’s internal communications are missing the mark. And, 60% of Millennials (the oft mentioned, burgeoning slice of the workforce pie) report that they don’t feel connected the company mission. So, that’s not to say that everyone is disengaged, but the ones who are will continue to spread some sinister vibes throughout the workplace, proving to be just as fatal as the leftover dip that still taking up space in the break room. This disengagement epidemic is what we’re fighting. At a recent AMA event in St. Louis, Fred Bendaña of CPG and Lisa Richter of Stakeholder Insights explained how experiential marketing drives internal engagement. I’ll share some of the high level points and my take on them below. How does internal communications combat employee disengagement? By following our strategy and using disruptive, experiential means to get in front of Southwest employees, the Rally attendance increased by 31%. A nice increase for ROI’s sake, but also a huge gain in people who can experience the love and participate in the company mission, face to face with their peers. This human capital is what drives change at the heart of the business. 1. Put your people at the heart of your story. It has to be authentic. Use their stories and their successes to drive home your communications. Your employees will relate to what they know and repel from counterfeit content. This develops trust and promotes brand transparency. By revealing your company mission in this manner, you increase your chances of connecting your people to purpose. 2. Leverage tech to connect, amplify and extend your message. What if your message was sitting in the palm of their hand the entire time? Digital communication increases your chances of not only reaching your audience but also of creating a dialogue with them. Whether it’s an app or a push notification or a gamified training program, connect with employees where they live – mobile. 3. Give your people an active voice. We call them Engagement Councils. These are diverse sections of your business that have their own ideas and their own paths to success. When everyone is participating in the conversation, your communication strategy is vetted by the best and has a much stronger chance of being sticky. 4. Activate experiential across the employee lifecycle. No one and dones here. From recruitment to onboarding to training and development to motivation, etc., you must continue to iterate your approach and find meaningful ways to connect with your people. Every part of the employee experience is a new opportunity to grow people in their roles and identify emerging leaders. 5. Provide immersive ways to instigate participation. Speaking of leaders – what better way to uncover the top performers in your workplace than to submerge them into hands-on, experiential leadership development programs. Normally considered a yawn-fest, this can be an opportunity to promote participation. No passive lectures and note-taking – these programs need to get leaders out of their seats and twist conventions on their head. If you’ve built your business around the right people, let them drive your success. By keeping them engaged through compelling communications and enticing experiences, you will develop the brand advocates that will grow your business. Check out some of the experiential leadership programs that CPG created to empower your people.